As I mentioned earlier, one of the snacks that we took along to our marathon sports day were Baguette Chips. This new product has 50% less fat than a regular potato chip and comes in two varieties - Cheddar Sun-Dried Tomato and Italian Cheese & Herb. I have always been a fan of what I will call bread based chips. Whether it is those little chips you find in Chex mix or bagel chips or pita chips, there is just something so appealing about them to me. I think that they have a stronger crunch than a typical chip and they seem to hold and embody the seasoning that is applied - whether it is a simple sea salt or something like the Cheddar Sun-Dried Tomato and Italian Cheese & Herb. If you are looking for a chip to dip, they also make excellent carriers of even the strongest dips - Artichoke Dip, Hummus or a Cream Cheese based dip. These new Baguette Chips did not disappoint. I rather enjoyed them. Since I am watching my calorie intake, I like that a 1 oz serving (~21 chips) is only 130 calories. To me, it feels like a satisfying size snack or side dish with a sandwich. 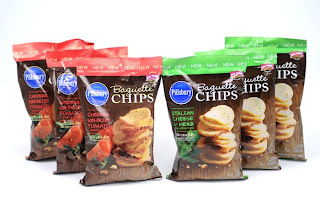 "Pillsbury knows just how you feel and wants to awaken your taste buds with their new Pillsbury® Baguette Chips! These hearty chips are sliced from oven baked bread and topped with savory seasonings bringing the unique and contemporary flavors of Italian Cheese & Herb and Cheddar Sun-dried Tomato to gourmet snack chips. The delicious flavors and perfect texture of these crispy chips can help you round out any recipe. + Enjoy Pillsbury Baguette Chips for a wide range of occasions: eat them alone, add a bit more flavor to your favorite dip, spice up soup, or add some crunch to your salad! *Pillsbury Baguette Chips (5g fat per 29g serving); regular potato chips (11g fat per 29g serving). See nutrition information for sodium content." Want to try them for yourself? Download a printable coupon for $0.75 off one package. Giveaway will remain open through July 25th. Giveaway is open to residents of the US only. One winner will be selected through Rafflecopter. The winner will have 48 hours to respond or a new winner will be selected. No compensation was received for this post. The product, gift pack, information, and additional sample have been provided by General Mills through MyBlogSpark. All opinions expressed are entirely my own or that of my family. I like Lay's Sour Cream and Onion chips. My favorite is RW Garcia Yellow Corn Tortilla Chips. Oddly enough, I think that tortilla chips are my favorite. Especially homemade ones!!! I like BBQ kettle chips. Chips are my weakness! I grew up in Canada where we have what seems like every flavor of chip imaginable, I miss Ketchup and All Dressed flavors! I love garden salsa sun chips. I like Lays Cheddar and Sour Cream Chips. My favorite chips are Riceworks. I love Organic Blue Tortilla chips! Yum! Ilove salt and vinegar chips! Mmmmm, Lay's Sour Cream and Onion Potato Chips.